Written by Warren Ellis, art by Fecundo Percio. Ellis introduces readers to the sultry Anna Mercury in this all-new color series! Dancing amid the spires of a city called New Ataraxia, there is a woman who can cloud men's minds, leap across buildings as if weightless, unerringly fire twin automatic pistols in the most insane conditions, and disappear in a crowded room. She fights against the political repression of an insane technocratic society, and she comes from a place that no-one in New Ataraxia has ever heard of. And she's got one hour to save the city from itself. A high-octane blend of The Shadow, Tomb Raider, retropunk science fiction and 21st century Weird Pulp Action, Anna Mercury is a headlong adventure serial about a beautiful and mysterious spy-adventurer who is not what she seems.... Anna Mercury will be a series of mini-series, starting with this five issue color series that features art by all-new talent Facundo Percio. This issue is available with a regular cover by Paul Duffield, a wraparound by Juan Jose Ryp, a Painted cover by artist Felipe Massafera, and also a rare 1-in-15 Design Sketch Edition featuring the initial character designs by Ryp. 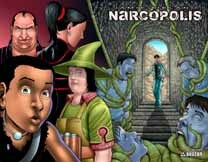 Written by Warren Ellis and Mike Wolfer, art by Raulo Caceres. He has seen and participated in some of the most horrific, supernatural events that mortal eyes have ever beheld, but when his personal integrity has been attacked, the line has just been crossed! 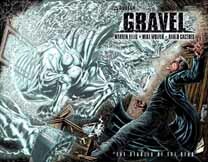 Combat Magician and Occult Detective William Gravel continues to cut a bloody swathe across the English countryside as he tracks down the next member of the Minor Seven, the secret enclave of occult practitioners who have unceremoniously ousted Gravel from their ranks. With two sections of the dissected occult artifact known as the Sigsand Manuscript now in his hands, Gravel has a new mission, beyond personal retribution: Retrieving of the remaining pieces of the Sigsand from the hands of the surviving Minor Seven. But that's easier said than done, when the next magician on his list is an apparition, in control of a stampeding, blood-thirsty herd of ghost horses that charge forth into the night from "The Stables Of The Dead!" This issue is available with a regular cover by Mike Wolfer, a wraparound by Raulo Caceres, and also a rare 1-in-15 Black Magic Edition featuring a new cover by Wolfer. Written by Warren Ellis, art and cover by Ivan Rodriguez. The Doktor and his Shrieky Girls are ready for the night! Now you can get this special Auxiliary edition of the first printing, which is limited to 1,500 copies, with a new cover by series artist Ivan Rodriguez still at the original cover price. Written by Garth Ennis, art and cover by Mike Wolfer. For those folks that missed out on the second issue of Garth Ennis� Western epic series, this is your lucky day! Now you can get this special Auxiliary edition of the first printing, which is limited to 2000 copies, with a new cover by series artist Mike Wolfer still at the original cover price. Written by Jamie Delano, art and covers by Jeremy Rock. Gray Neighbor has now been fully sucked into being an agent of TRUST and with his infatuation, Agent Love, as his training officer, life might not be so bad. But a mission to deploy a CleanTeam causes his curious streak to rise up again and he goes searching for the truth in the bowels of the city, and the filthy secrets of MamaDream begin to reveal themselves. Crafting whole new chunks of language, and stunning concepts of a bizarre new world, Delano delivers a masterful new series that has to been seen to be believed! New artist Jeremy Rock provides stunningly detailed sequential pages that fully compliment this truly revolutionary book. Each issue is available with a regular and wraparound cover by Jeremy Rock and also a rare 1-in-15 Design Sketch Cover Edition by Rock. Written by Warren Ellis, art and cover by Juan Jose Ryp. The three luscious ladies of Black Summer are all ready for combat! All the issues of Black Summer have been selling out fast, but now you can get this special Auxiliary edition of the first printing of #5, which is limited to 2000 copies, with a new cover by series artist Juan Jose Ryp still at the original cover price of $2.99! The team of the Guns is hot on the trail of the most-wanted man alive -- Horus! All the issues of Black Summer have been selling out fast, but now you can get this special Auxiliary edition of the first printing of #6, which is limited to 2000 copies, with a new cover by series artist Juan Jose Ryp still at the original cover price of $2.99!